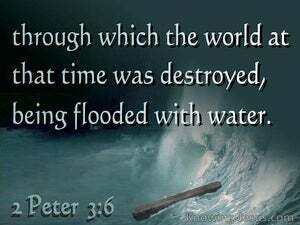 ﻿ 2 Peter 3:6 through which the world at that time was destroyed, being flooded with water. Through these the world of that time perished when it was flooded by water. by which the world at that time was deluged with water and destroyed. by which the world then perished, having been overflowed with water. Through which the world that then [existed] was deluged with water and perished. [And] it was by water that the world, which existed at that time, perished in a great flood [of Noah's day]! by which things the world that then was, having been overflowed with water, perished. And that the world which then was came to an end through the overflowing of the waters. through which the world at that time was destroyed, being deluged with water. whence the former world was destroyed by an inundation. through which waters the then world, deluged with water, perished. by which the world that then was, being deluged with water, perished. by which also that world was destroyed, through being flooded with water. Thro' which the world that then was, being overflowed with water perished. by means of which things the world that existed at that time was destroyed [by] being inundated with water. through which the world that then was, being flooded by water, perished. by the which things the world that then was perished, overflowen with the water. and that by the same means the world which then existed was destroyed by a deluge of water. Through these things the world existing at that time was destroyed when it was deluged with water. by which means the world that then was, being overflowed with water, perished. 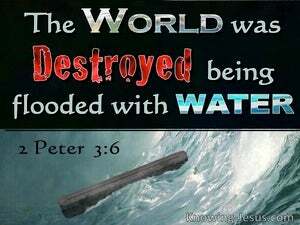 by which the world that then was, being overflowed with water, was destroyed. and that by the same means the world which then existed was destroyed in a deluge of water. and that, by means of these, the then existing race of men was overwhelmed with water and perished. by which also the world, through being deluged with water, was destroyed. Whence the old world being drowned in water perished. 5 For when they maintain this, it escapes their notice that by the word of God the heavens existed long ago and the earth was formed out of water and by water, 6 through which the world at that time was destroyed, being flooded with water. 7 But by His word the present heavens and earth are being reserved for fire, kept for the day of judgment and destruction of ungodly men. "Behold, He restrains the waters, and they dry up; And He sends them out, and they inundate the earth. they were eating, they were drinking, they were marrying, they were being given in marriage, until the day that Noah entered the ark, and the flood came and destroyed them all.